Hair breakage generally occurs for one of two main reasons: styling damage or from the hair becoming very dry and brittle. 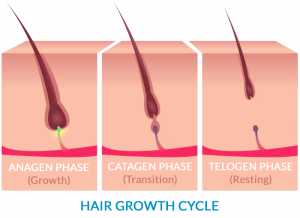 It is not a hair loss condition as such, because it does not affect the hair follicle; instead it causes the hair shaft to snap, which can give the hair an unhealthy, thin appearance and a course texture to the hair. There are a number of different forms of styling damage that can cause hair loss. These include an over-reliance on heat-styling tools such as hair straighteners, curling irons or even a too-hot hairdryer; excessive use of harsh chemicals from hair bleach and dyes to perming or straightening solutions, as well as wearing the hair in tightly-fixed damaging styles, like braids or hair extensions, which can cause the hair to snap. This is why hair breakage is often seen in conjunction with the hair loss condition Traction Alopecia. Hair breakage is particularly common in people with chemically treated or dry hair, especially black men and women with afro hair which has a naturally dry texture, as it is easier for dry hair to become brittle. This can happen for various reasons including nutrient deficiencies, as a side-effect of a medical condition, or as a result of over-use of chemicals such as hair bleach. Ensuring you keep your hair sufficiently moisturised using dedicated shampoos and conditioners for your specific hair type can help to prevent the hair from becoming too dry. If you use chemical treatments on your hair, you may want to add a regular intensive conditioning hair mask to your routine to further strengthen your hair and keep it in good condition. Switching to a natural, organic hair dye may also be beneficial. If you use heat-styling equipment on your hair, try not to over-do it and always prepare the hair with a misting of heat protection spray first to minimise any damage. Make sure you use your hair dryer on the medium setting and keep heat stylers set to 180°C or below. Including plenty of nutrients that promote healthy hair in your diet can also be beneficial, as can topping up with a food supplement such as Hair Vitalics. This exclusive, potent one-a-day supplement for healthy hair growth was formulated by Belgravia’s experts to include key hair-friendly vitamins, minerals, amino acids and botancial extracts. It comes in Hair Vitalics for Men and Hair Vitalics for Women options in order to provide truly targeted support. In the winter, atmospheric changes like an increase in central heating may dry your hair so adjust your hair care routine to take this into consideration. A humidifier can also help to counteract the drying effects of heat from radiators by adding moisture back into the air. Sun damage in the summer presents another seasonal hair challenge that can lead to breakage so remember to pack heat-protective hair products with an SPF if you’re off on holiday. Alternatively wearing a hat or spending time indoors, or at least in the shade, during the hottest part of the day can give your hair a helping hand, as can using intensive conditioners and letting your hair dry naturally. Following these tips and keeping your hair in good condition by getting regular trims or cuts, should help you to avoid serious hair breakage. For hair that is already damaged, if you are experiencing breakage you should visit your hairdresser for nourishing treatments and to have the snapped ends dealt with professionally. They will be able to talk you through hairstyles that may help to disguise any damage whilst you work to repair it and wait for new hair growth. As part of your regrowth regime you should avoid the causes of hair breakage, including heat styling, harsh chemicals, and tightly-tied hairstyles or extensions. If your hair started to become brittle around the same time you started a new medication or became unwell, you should discuss this with your GP as hair loss can be an early warning of various illnesses, as well as being a side-effect of some medications. If, once your snapped shafts have been tidied up, you still feel as if there is excessive shedding, or if you notice any patchy hair loss in addition to the breakage, you may want to consult a hair loss specialist for expert advice. They will be able to assess whether you are also experiencing a hair loss condition and talk you through how to deal with it, including recommending the best, personalised course of hair loss treatments to help you restore your hair.